Join RQ's REBELUSION an experience of percussions & beats! 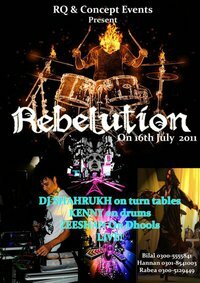 CIrcuit performing live- including DJ Shahrukh on turn tables, Kenny on Drums and Zeeeshan on Dhools. Live and exclusive!